This dagger is made of heat-treated Texas flint. It is 32.5 cm long. 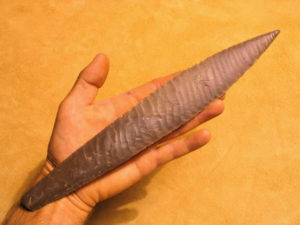 This dagger is made of heat-treated Texas flint. It is 31.5 cm long. 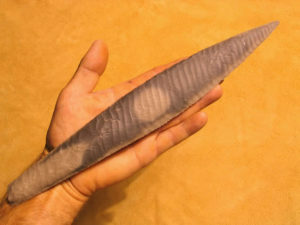 This dagger is made of heat-treated Texas flint. It is 31 cm long. 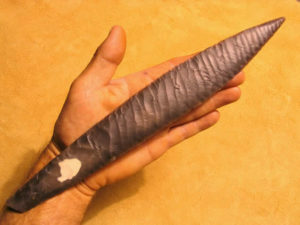 This dagger is made of heat-treated Texas flint. It is 27.2 cm long. This is an excellent example of edge to edge pressure flaking. 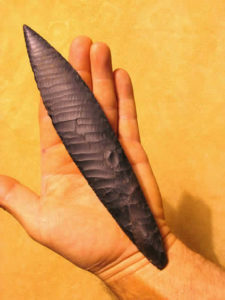 This dagger is made of heat-treated Wyoming oil chert. It is 21.5 cm long. 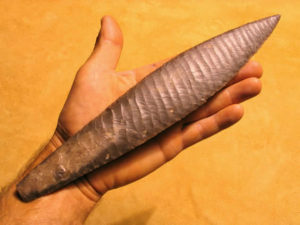 Type 1C dagger preform in progress is made of non heat- treated Texas chert. It is 45 cm long.